GOPALGANJ: A floating cabbage field at Mritodanga village of Joaraia Union in Tungipara Upazila in the district seen in the picture. Photo was taken on Friday. 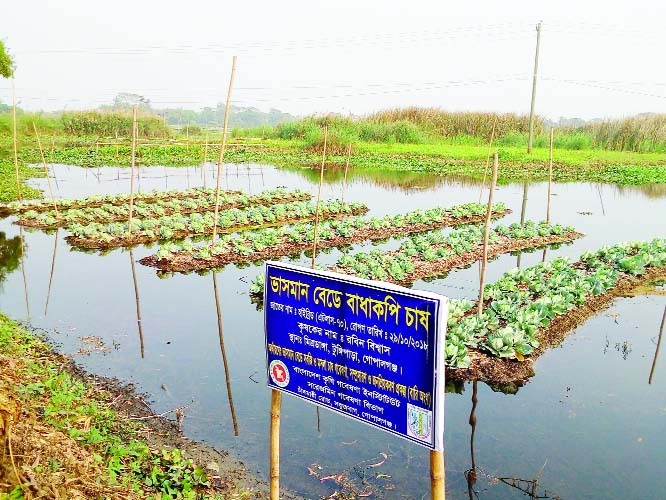 Floating cbbage farming is gaining popularity among the farmers of Joaria Union under Tungipara Upazila in the district recently. As it has proved a profitable crop in this region. This hybrid cabbage origin 'Atlass-70' invented by Bangladesh Agriculture Research Institute (BARI) a high yielding variety of vegetable crop besides a high protein. About 80 farmers family in Joaria union under Tungipara Upazila in Gopalganj district farming this vegetable (cabage) origin Atlass-70 this current season. Rabin Biswas (40), a farmer of village Mitrodanga under Tungipara Upazila in the district said, he cultivating cabbage origin Atlass-70 on 18 nos floating fields near his residence without chemical fertilizer & pesticides by this time he got a good profit from it produce this season. One stage Rabin said, I think a farmer easily can farming this vegetable (cabbage) on his floating land not only that later he using (farming) two years on same land, Rabin said. The farmers of Tungipara areas cultivating on the crop commercially now and the maximum producing areas are Joaraia, Mritodanga, Baladanga, Pathrail, Bonnabari, Balargati and Gopalpur with etc. under Tungipara Upazila in the district.